The Legend 943 Neck Machine is an excellent training solution for the overlooked muscle groups of..
Our designers took the challenge . . . refined geometry, improved ergonomics and an obsessive ded.. The FreeMotion EPIC Selectorized Assisted Dip-Chin functionally trains muscles in back, upper arm..
Only the quads know. But you will, too . . . after using the Legend 911 Leg Extension. Get ready .. The FreeMotion Genesis Shoulder Press strengthens your body for sport-specific movements like box.. 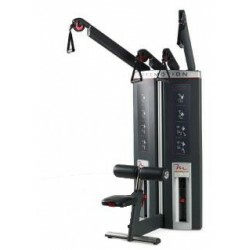 The FreeMotion Genesis Dual Station Lat Pull-High Row engages the arms, shoulders, back and stabi.. High-tech engineering and innovative design made it all happen in the Legend 953 Functional Train.. The FreeMotion EPIC Selectorized Chest strengthens and isolates the chest muscles for activities .. The FreeMotion LIVEAXIS™ Rotary allows you to perform multiple workouts at one station. The pulle.. There is more here than meets the eye! With correct biomechanics, total adjustability, and a comf.. Featuring independent arm movements, pivoting arms that adjust to arm length, dual position hand .. The FreeMotion EPIC Selectorized Calf Extension enhances strength for sport-specific movements li..
Gain the edge when the Legend 914 Supine Leg Press is on your side. The Leg Press is a machine of.. The FreeMotion Bicep Press targets muscles in the forearm, biceps and shoulders. Functionally tra.. Engage multiple muscles and unlock explosive leg power with the FreeMotion Genesis Dual Station Q..